Sorry if my absence worried you, but all is well. I was in England for the holidays with the British side of my family. Then I flew to San Francisco for one last mother-daughter vacation before she starts college in February. I'll leave California and my daughter's gap term for future blog posts. 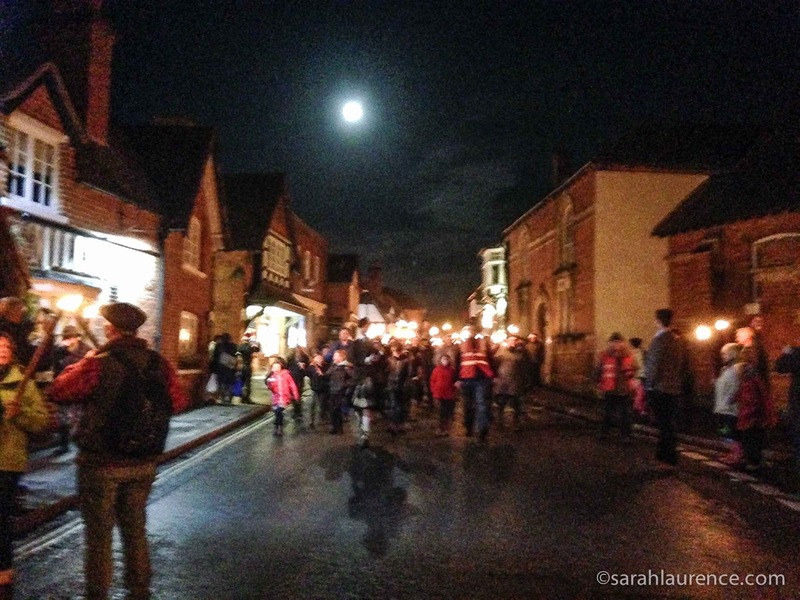 Even without snow, Christmas is special in my husband's hometown. 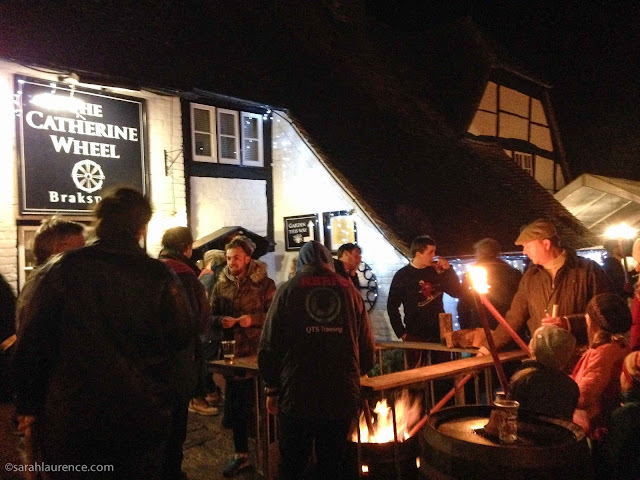 On Christmas Eve villagers light torches at The Catherine Wheel's firepit, many grabbing a pint of ale before or after. 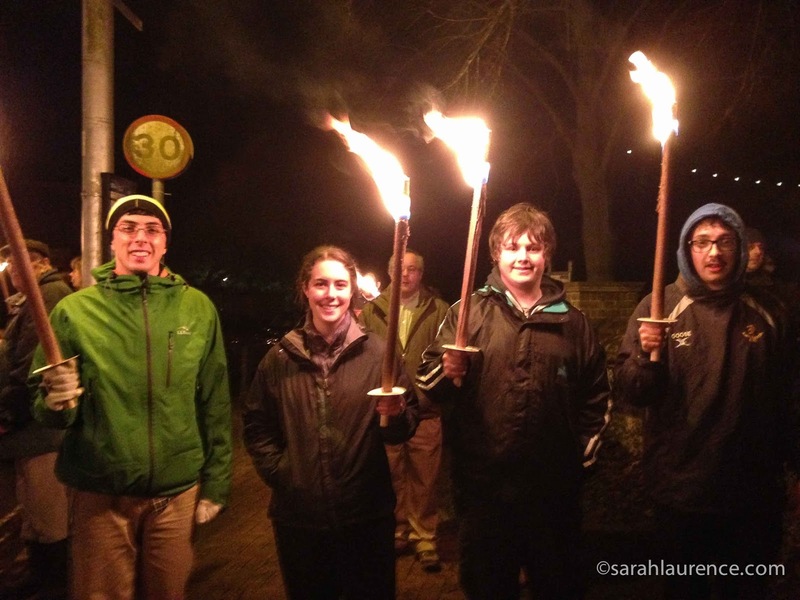 The cousins were happy to be reunited for the occasion with real flaming torches. A bagpipe player in a kilt leads the procession of hundreds through the ancient village. I apologize for my grainy iPhone photos, but even with a full moon, it was quite dark. 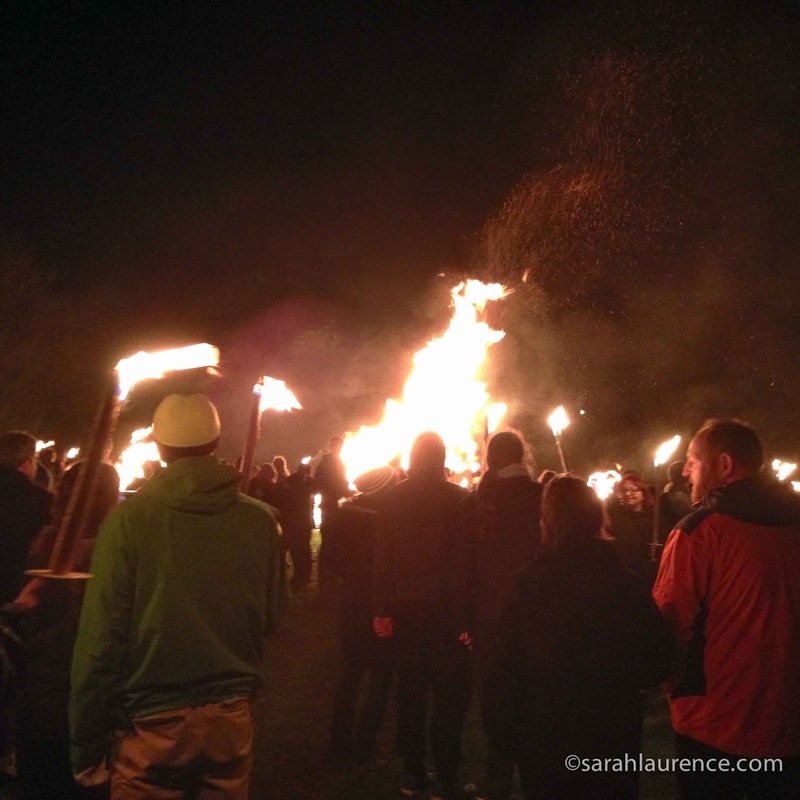 We crossed the Thames River and gathered round a huge bonfire to sing Christmas carols, accompanied by a live brass band. Later at night there's a midnight mass in the Norman church. My father-in-law and his mates ring the bells for services at two churches. On Christmas morning we go to church. 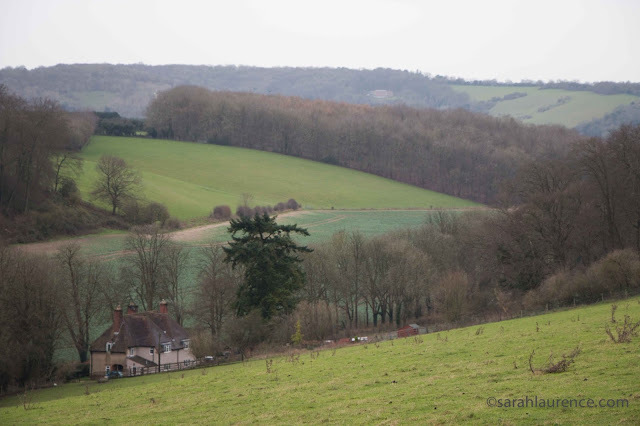 After listening to the Queen's speech on TV, we open presents and go for a country walk in the rain. We warm up with a hot cup of tea and Christmas cake (fruit cake with a marzipan frosting). Christmas dinner is always roast turkey with chestnut stuffing and brussel sprouts. 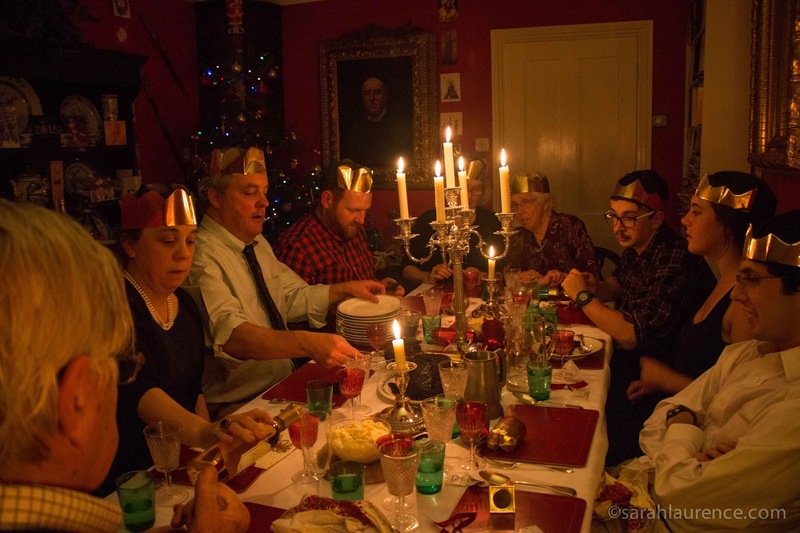 We pull Christmas crackers and don crowns whilst the Christmas pudding flames. You need to chew carefully to avoid biting into the lucky sixpence. 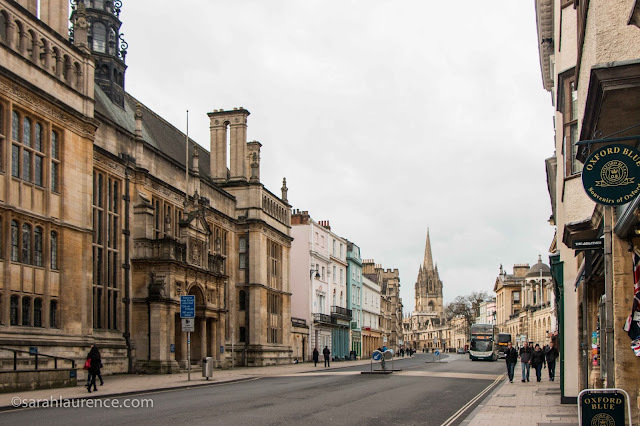 On Boxing Day (the day after Christmas) we drove to Oxford since the trains weren't running. Not much was open. England shuts down for most of the holidays. 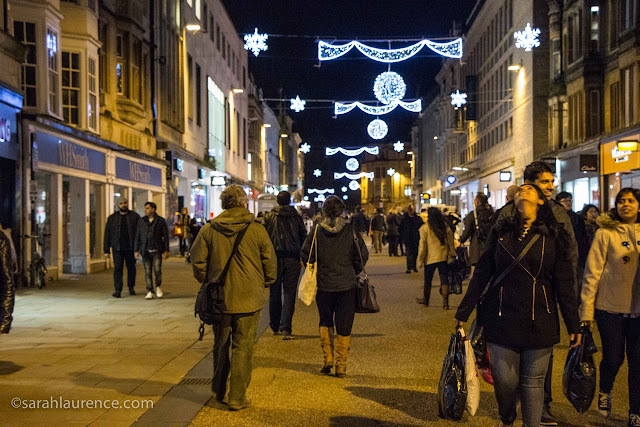 The busy university town was blissfully free of crowds. 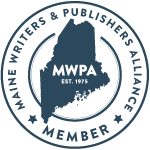 I'd spent a year there with my family researching my work in progress, a young adult novel about an American girl at a British boarding school. The holiday lights in Oxford are marvelous. I love the expression on the woman to the right. 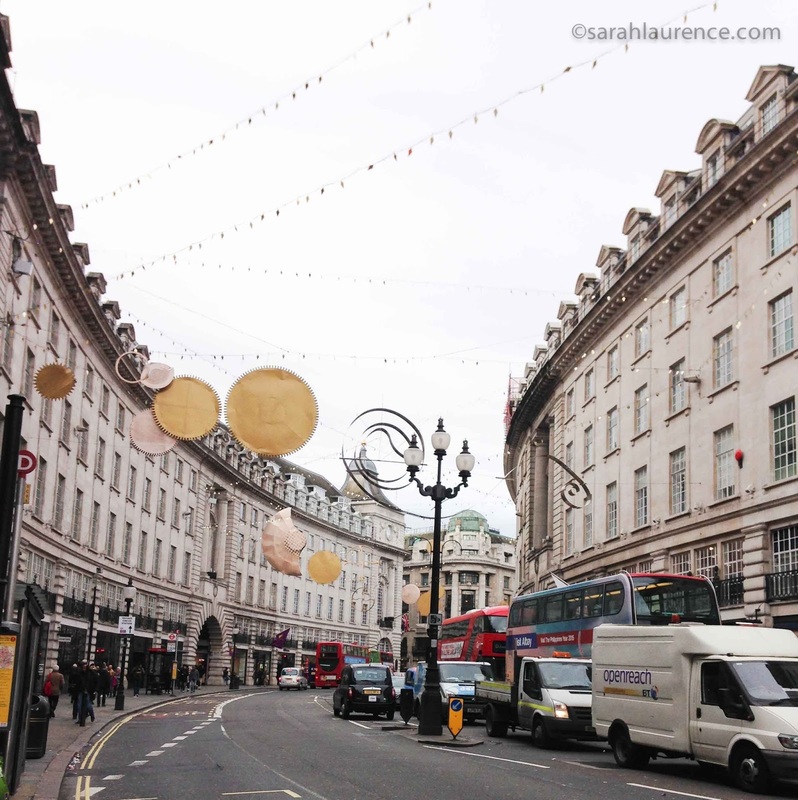 When the trains were back on track, we traveled an hour to London. My daughter wanted to shop on Regent (at left) and Oxford streets, and I needed to check out the holiday lights for a new scene in my novel. I'll have to draw on older memories of clubbing in London. I love my job! That night we went to Tate Modern, a favorite museum. Then we headed next door for a delicious pub dinner of roast pheasant and a candlelit performance at the Globe's new covered theatre. Pericles is not Shakespeare's best play - it was written with a collaborator, quite possibly a young apprentice - but it was thrilling to see his work staged in the traditional manner with no electricity and ancient instruments. We walked back over the Millennial Bridge in a drizzle, admiring the view over the Thames. 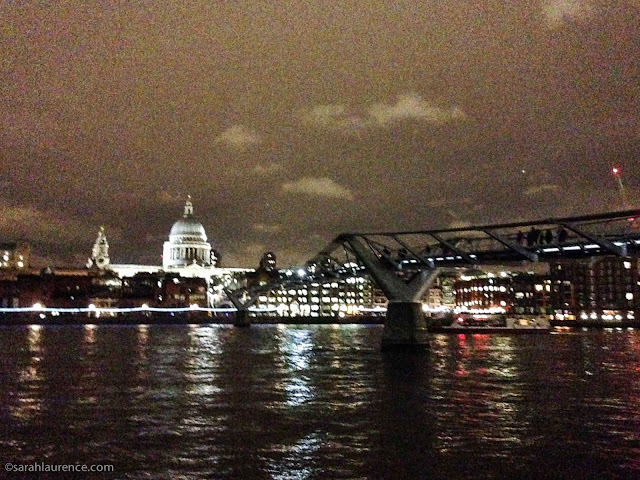 Is it my imagination or is St. Paul's Cathedral not as brightly illuminated as it used to be? 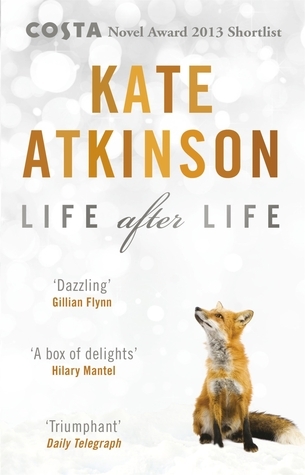 I like matching my reading to my travels and have been enjoying Life After Life by Kate Atkinson, a gift from my mother-in-law (thanks!) From this historical novel, I learned that architects volunteered to keep St. Paul's flame-free during the blitz. The narrative is a series of alternate histories based on the protagonist's choices, giving it an existential resonance. I often wonder what my life would have been like if my husband hadn't quit his banking job in London to pursue an academic career in the USA. Three quarters through this 600 page book, I'm loving Life After Life and would recommend it to anyone. 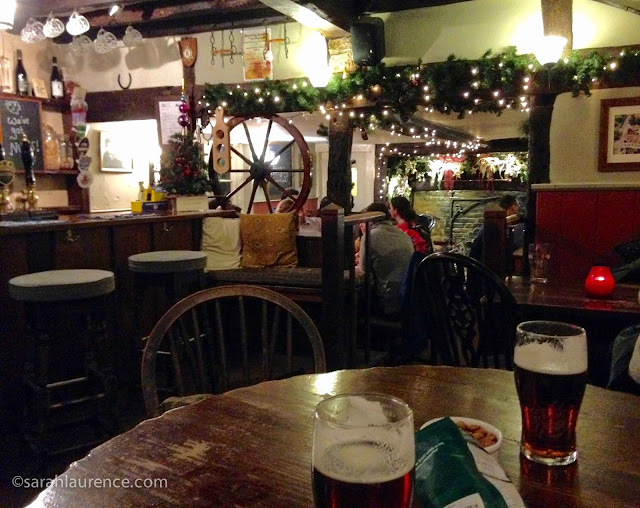 Henry and I toasted the new year with Brakspear Special back at the Catherine Wheel with a blazing fire in the hearth. A belated Happy New Year! I look forward to catching up with you and your blogs. Cheers! I am glad you were able to have an English Christmas, and as an Anglophile I am also glad you shared it with the blogging public. I am sure the pub was named for one of the term's other meanings, but the Catherine Wheel brings me back to the 80's and my favorite David Byrne work, and my favorite Simple Minds tune. It was lovely to see your Christmas in England, is it different from back across the pond or are most things done in a similar fashion? You look as if you avoided the rain which swept over the north of the country. I escaped to Paris where my eldest son and family live and unbelievably we had blue skies and sunshine all the time. May you have a wonderful 2016. Les, I wondered too about the origin of the Catherine Wheel. I'd prefer David Byrne or fireworks to medieval torture! Old pubs often chose symbolic names easy to portray on a sign as many patrons were illiterate. Rosemary, being half Jewish, I'm not really an expert on Christmas, but I was struck how traditionally Christmas is observed in the UK. There is more variety in the USA as people from varied national backgrounds bring their own cultural traditions like Italian Americans adding pasta to their roast dinners. Also Christmas tends to be more commercial in the USA with colorful, gaudy lights, men dressed as Santa in department stores and an emphasis on buying lots of new toys for kids. We did get a lot of rain and minor flooding but not as bad as the north. Lucky you to go to sunny Paris for Christmas! Happy New Year to you too! What a lovely holiday you had in England! I love seeing how Christmas is celebrated in other countries. It looks like you had a marvelous time with your family. The older I get the more low-key I prefer the holiday to be. You're right, it has become much too gaudy and commercialized here in the States. Speaking of the blitz, we were so pleased to attend a book lecture the other evening given by Jonathan Sandys, the great-grandson of Sir Winston Churchill. He and another gentleman (can't recall his name right now) have written a book called GOD AND CHURCHILL. It's really quite fascinating, what I've managed to read so far when I can sneak a peek at it. SAM has claimed first reading rights since I have another book I'm supposed to finish for book club discussion next week. Tina and Pamela, thank you! w2w, thanks for the book recommendation. A Churchill biography might appeal to my husband especially. We have been fighting over Between the World and Me, a book I'm reviewing on Wednesday and that he's reading for his book group. Glad you're back. What lovely Christmas photos. Thx for sharing them. Wonderful. Good to read your back home safe and sound. 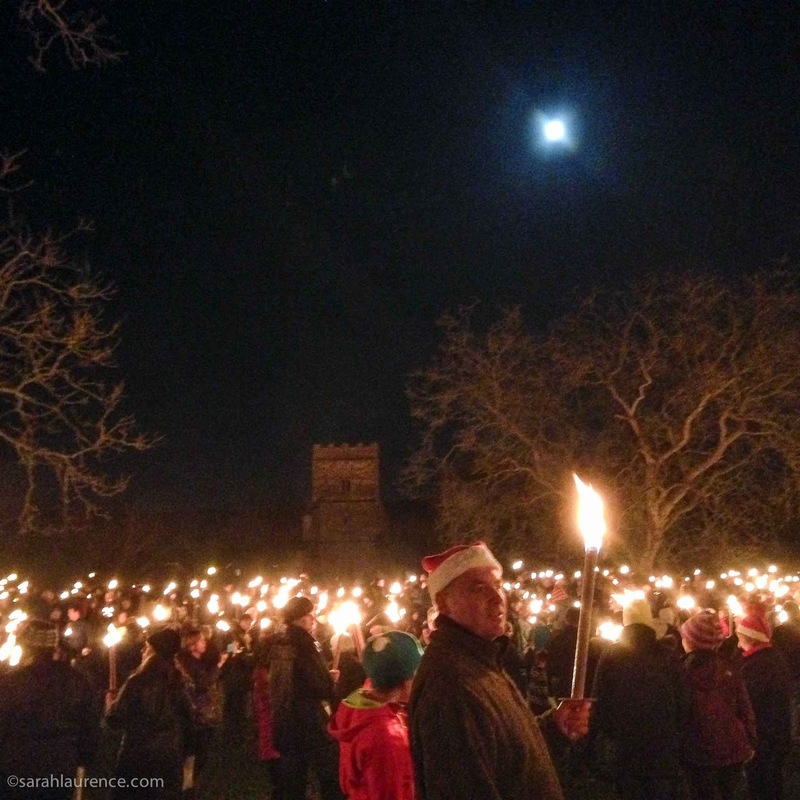 The first couple of pictures and my ignorance of English Christmas customs led me to think, perhaps, you had joined the Guy Fawkes torch carriers. Sarah, I so enjoyed reading this and looking at your pictures. I think you are right that English Christmas has more of a traditional form -- and most people like to stick with that. My family only likes an English Christmas now. In your pictures of London, I think you mean St. Paul's and not St. Peter's? But yes, it does seem smaller and more muted with all of the big buildings on both sides of the Thames. Amanda, my WIP does include a pub visit since the drinking age is younger in the UK. troutbirder, you made me laugh. I couldn't help thinking that the villagers were going to burn the manner down or hunt down a vampire. For Guy Fawkes you'd roast a scarecrow on the bonfire and the songs would be more bawdy. Bee, we rather like a English Christmas too, but the kids grumble about waiting until after the Queen's speech for presents. Thanks for catching my slip; I've amended the post to St. Paul's. Perhaps it is the contrast with the other buildings or maybe they are dimming the lights to conserve energy. Nonetheless, I do love London at night even in the drizzle. I LOVED seeing all these photos--thanks for sharing your trip. What a wonderful place to spend Christmas. Happy New Year!